accepted by all religions, a kind of `World view` on what is reality, the universe, life and consciousness, etc. Such a `world view`, can bring about fusion of science and religion, and thereby unite all religions, which is a prime requirement to end conflicts and wars. 1) The Philosophical model based on the initial condition that the universe must make sense. 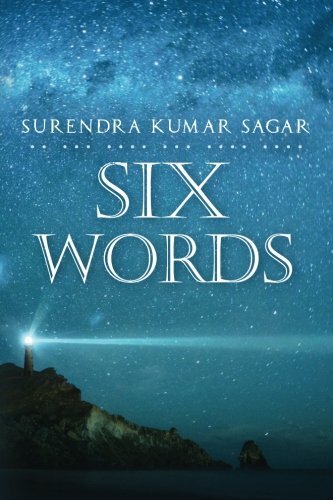 2) The concept of a Seminar held in a parallel universe shown live on television in that parallel universe, where the philosophy of the `Six words` is transmitted to the world, and creates a big impact. 3) The idea that the all intelligent `infinite mind` present everywhere in time and space could explain some of the features of Quantum Physics such as `quantum entanglement `for one. 4) The idea that this `Infinite mind` can travel to and fro in space as well as time and remains most of the time in the Stelliferrous era where stars are shining and life and consciousness is flourishing. 1) My “hook” is probably how this book being of a general purpose of discussing Science and Philosophy is actually my Autobiography. 2) That this autobiography begins at the big bang itself, it is in fact the autobiography of a quark. 4)`The guessing of the Six Words and the desire to read the book once more`. 5) The Complete story of Quantum Physics and its sequential development over the years, has been placed on a platter for the benefit of the readers. The non Scientists will love it. In thirty odd pages, they will learn enough Quantum Physics to be able to understand and appreciate the philosophical impacts of the subject. This is an enormous ``HOOK``.